There are color pictures later, I promise. 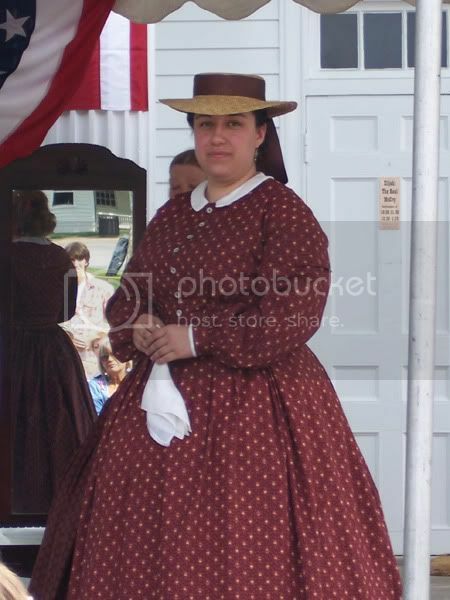 Unlike my very first 1860s project, the ballgown, I was in love with this day dress before I even started it. The fabric was a gift from my friend Tyler Putman of the Superior Cap & Regalia Company, free on the condition that I agree to actually make something out of it rather than just use it to build up my fabric stash. He then also supplied the buttons--original Prosser or "ringer" buttons--that perfectly complimented the fabric. The dress itself is a beautiful soft calico in a deep red, printed with little yellow and orange flame-like paisleys and little orange flowers. Looking at my previously-made color choices, I don't think Tyler could have picked a more perfect fabric to send me. 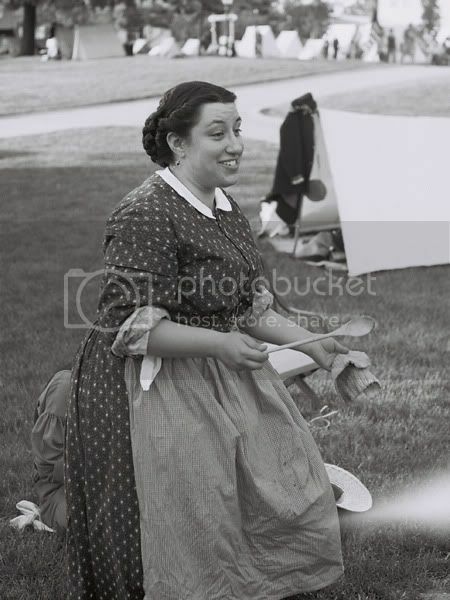 I used the Laughing Moon 1860s day dress pattern, which was a Godsend. I can drape an 18th century block in fifteen minutes, but I found the drastically different style lines of the 19th century somewhat intimidating. 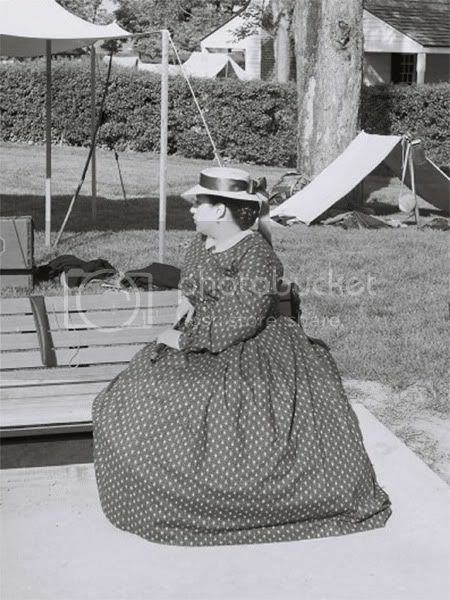 The maiden voyage of dress, hoop, and hat, captured artistically on film by Tyler Putman, Enabler. The fabric was forty inches wide, give or take, so I used four panels in the skirt. There's about eighty inches of fabric gauged or cartridge pleated into the center back of the waistband, and then the rest of it is distributed with box and knife pleats. Both skirt and bodice open in the center front and are closed with hooks and bars. The buttons are purely ornamental. I also changed the sleeve style from the pattern to make it a bishop sleeve, adding a little sleeve jockey or cap sleeve, too. Ideally, the cap sleeve would be trimmed--that may come at a later date. Here's how the dress finished out the weekend--and I'll admit, I like this much better. No hoop, no hat, sleeves rolled up, apron donned, and cooking over the fire. This is how it ought to be! I was absolutely thrilled with the extreme "wearability" of this dress. Once I got out of the hoop and into camping mode, I had a fantastic time. This dress as a work dress is probably one of my new favorite outfits. It was easy to wear and easy to work in, which I love. 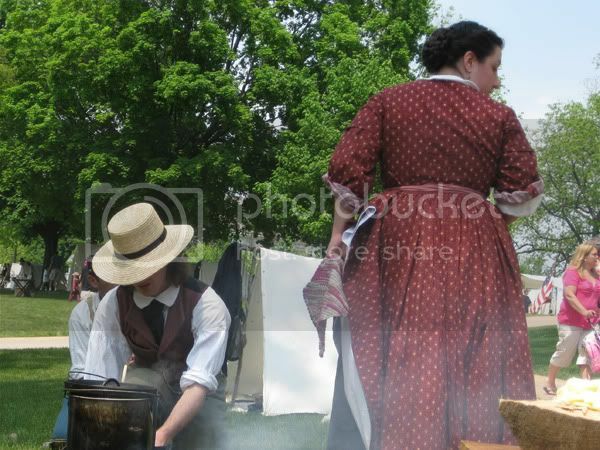 The highlight of my weekend was making lunch over a fire in the camp of the 26th Michigan with my sleeves rolled up and my skirt tucked up in the ties of my apron. One of the best moments of the entire weekend.